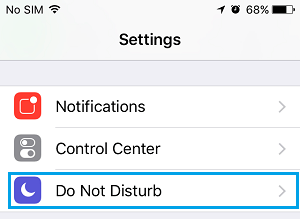 The default settings for “Do Not Disturb” mode on iPhone do not block all Calls and are not really effective in preventing you from getting Disturbed. However, it is easy to configure and use Do Not Disturb mode on iPhone to suit your own requirements. Like many iPhone users, you might be using the physical Mute button on your iPhone to silence Calls during your most busy period of the day. However, using the Mute button silences all the Calls on your iPhone and increases the chances of missing important Calls or urgent calls from your family members. A better way of preventing anyone from bothering you during busy periods is to use Do Not Disturb Mode as available on your iPhone and configure Do Not Disturb to suit your requirements for the day. The advantage of using “Do Not Disturb” mode is that you can configure it to allow Calls from important Contacts or Family members while silencing all other Calls. Another advantage of using Do Not Disturb Mode is that it prevents your iPhone from lighting up, whenever a Call, Alert or Notification is received. As you must have noticed, using the Physical Mute button cannot prevent iPhone from lighting up and distracting you, whenever a Call, Alert or Notifications is received on your iPhone. Follow the steps below to activate Do Not Disturb Mode on your iPhone. 3. On the Next Screen, move the toggle next for Do Not Disturb to ON Position. 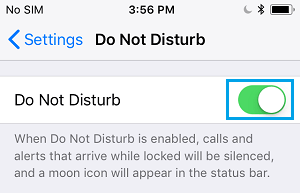 This will enable Do Not Disturb Mode on your iPhone with default settings, which allows Calls from “Favourite Contacts” and also allows “Repeated Calls” (if someone Calls within 3 minutes of his/her first call). Let us now take a look at How to configure and Use Do Not Disturb Mode on iPhone to suit your own unique requirements. The option for Repeated Calls is enabled by default on iPhone and this allows anyone to ring your iPhone even during “Do Not Disturb” mode by making a second call within 3 minutes of the first Call. However, you can easily prevent your iPhone from allowing Repeated Calls during Do Not Disturb Mode. 1. Tap on Settings > Do Not Disturb. 2. On the Do Not Disturb Screen, scroll down and Disable the option for Repeated Calls. The default iPhone Setting allows Calls from your Favourite Contacts during the Do Not Disturb Mode while Silencing all other Calls. However, you can fine tune this option by tapping on Allow Calls From Entry. 2. On the Do Not Disturb Screen, scroll down and tap on Allow Calls From option. 3. On the next screen, you can tap on “All Contacts” to allow Calls only from those who are on your Contact List or choose other options. You can, tap on No One, in case you are absolutely sure that you do not want any Calls during your busy period. Alternatively, you can tap on Favorites and allow Calls from only those Contacts that you have marked as Favorite in your Contact List. Another option is to Create a Contact Group with only the most essential Contacts and allow Calls from this Contact Group during Do Not Disturb Mode. 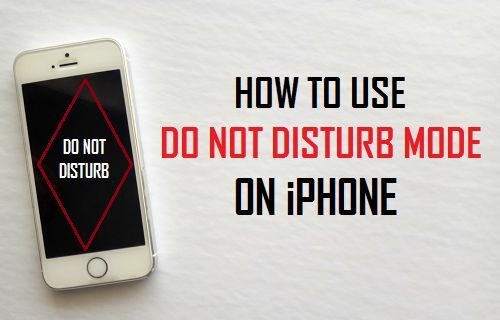 In case there a fixed time period during which you are most likely to be busy on most days, you make your iPhone to automatically go into Do Not Disturb Mode during this period. 4. On the next screen, tap on From and choose the start time for Do Not Disturb from bottom of the screen (See image below). Next, tap on the To option and select time from bottom of the screen. Note: You can only set one continuous period or block of time as Do Not Disturb period on iPhone, you won’t be able to multiple blocks of time. The default “Do Not Disturb” mode Setting prevents your iPhone from ringing only while it is Locked and allows Calls to Ring on your iPhone while it is unlocked. However, you can always prevent your iPhone from ringing at all time during “Do Not Disturb” mode by choosing the “Always” option. 2. On the Do Not Disturb Screen, scroll down to the bottom of the screen and tap on Always. This will prevent your iPhone from Ringing during “Do Not Disturb” period, irrespective of whether its screen is locked or unlocked.